GQA Qualifications: Print Finisher Stef achieves with More! Print Finisher Stef achieves with More! Stef Threlfall joined Birtwell and Co Ltd in November 2006 as a member of their automated collating and print finishing team and has proved to be a reliable and valuable member of staff. 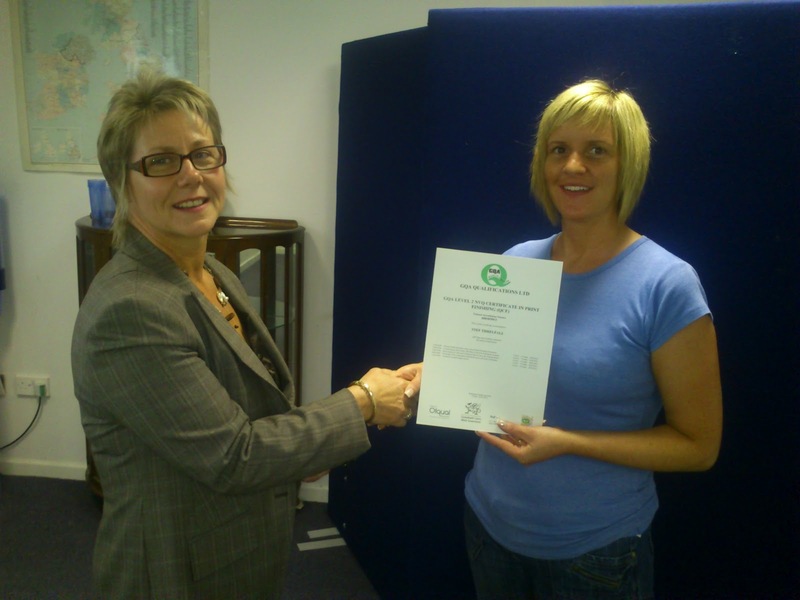 In January 2012, Birtwell and Co registered Stef on the GQA Level 2 NVQ Certificate in Print Finishing with the GQA Approved Centre, MORE Training, based in Tunstall, Stoke-on-Trent. Stef initially expressed concerns that she might not be able to handle the workload whilst continuing to work her shift pattern and looking after a young family with 2 children. It is testament to her commitment to the qualification that, working with her assessor, Charles Booth, she was able to remain focused on the project and she achieved her GQA qualification in July 2012, much to the delight of the team at MORE Training and Birtwell and Co.
Stef is the first of four candidates who started the Print Finishing qualification at the same time, and has an impressive portfolio that she can be proud of. Birtwell and Co Ltd has committed to putting ten members of staff through Print qualifications using MORE Training Ltd. Since MORE Training has started using GQA Qualifications to certificate it's qualifications, Stef is the first person to complete an adult NVQ QCF qualification.